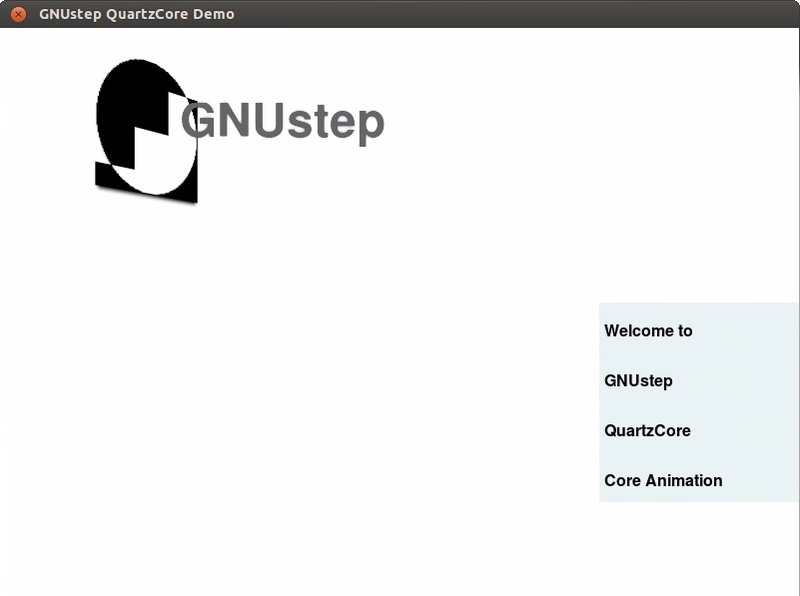 This mini-site serves solely to document existence of GNUstep QuartzCore. It was written as part of Google Summer of Code, and currently (September 2012) includes a subset of Core Animation-compatible APIs. GSQuartzCore comes under the GNU LGPLv2. I wrote the code, but copyright is assigned to the Free Software Foundation. Here's the reason why I sprouted up this mini-site: the video recording of the state of the project as shipped on Aug20 deadline for Google Summer of Code 2012. Video below is the QuartzCoreDemo app, shipping in the "Demo" subdirectory of the Subversion repository root for this project. It's a mostly non-interactive demo featuring some animations, including a demo of animation of 3D transforms that Core Animation supports. Interactivity is a bit of a hack, but with an additional layer above it, one could have a modern animated slick user interface usable under GNUstep. One could also develop a presentation tool, animation tool, and perhaps even an image editing tool with support for layers.